Her is a link to the minimalist baker website. They have created an amazing series of videos to help you set up and customize your foodie child theme for food bloggers. I think these videos might even help with setting up other genesis themes as well. This entry was posted in Resources on 19 November 2014 by Milen B. Gala (@galaliving). An editorial calendar is a great place where you can see all of your content in a single place, you can lay out your entire content publishing plan. Here are some of the benefits of using editorial calendars. Gives you a visual view of your content plan. You can lay out your publications by date and time to better organize your blog posts. Provides a canvas for blog post ideas and topics. Let’s say you want to publish one recipe per week and one post about a wellness topic. This allowed you to see that in one simple format. This is also a great management platform for editorial tasks and team members, if you have multiple authors. Some plugins give you Drag-and-drop simplicity for adjusting your schedule. For any blogger who is looking to get their content more organized and editorial calendar may be the best place to start (and possibly keep) on the site! This entry was posted in Design on 19 November 2014 by Milen B. Gala (@galaliving). Profoodblogger.com did a really though review of all the available widgets for food bloggers and specifically for recipes. These widgets do everything form layout your recipe page using easy cut and paste options, allowing for pictures, nutritional information, notes and the like. Many of them have search engine optimization features. These are definitely worth checking out!! This entry was posted in Design on 3 November 2014 by Milen B. Gala (@galaliving). This is an awesome little article by Matt Elliott on CNET. This shortcut is one that I wish I had learned two years ago and had no idea it was possible. I would spend hours writing stuff up in other programs and copying and pasting things to the post pages just so I could avoid this double spacing issue. Read it and use it to your hearts content!! This entry was posted in WordPress How-To on 28 October 2014 by Milen B. Gala (@galaliving). I’m searching for themes that will make my new site GalaLiving look fantastic. The thing is that it has to incorporate articles about healthy living and other topics as well as house recipes. The recipes instruction pages need to be precise and in a simple, eye pleasing layout (and possibly even able to print easily), but it also has to make all the other posts look fantastic. Here are 3 themes that I think would do the job amazingly well. 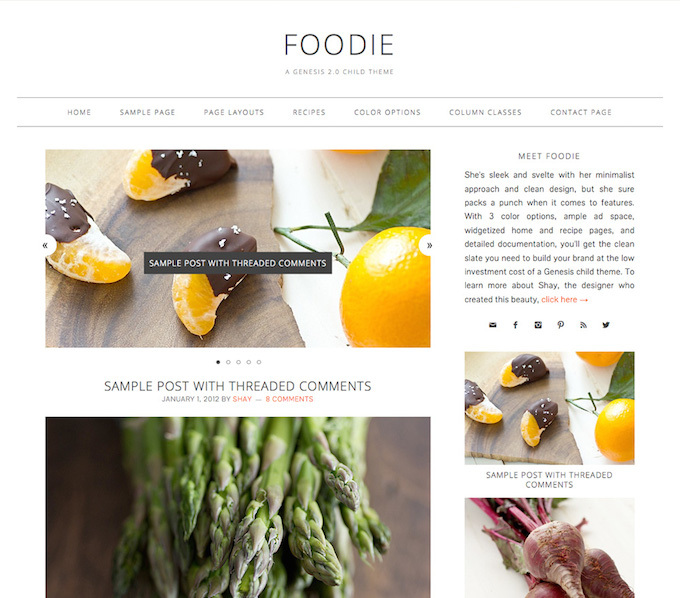 The Foodie Pro Theme ($129.95) is a simple and elegant theme that highlights pictures nicely. It is a Genesis Theme that includes mobile responsiveness so it works seamlessly on iPads and other mobile devices. It includes 6 layout options. 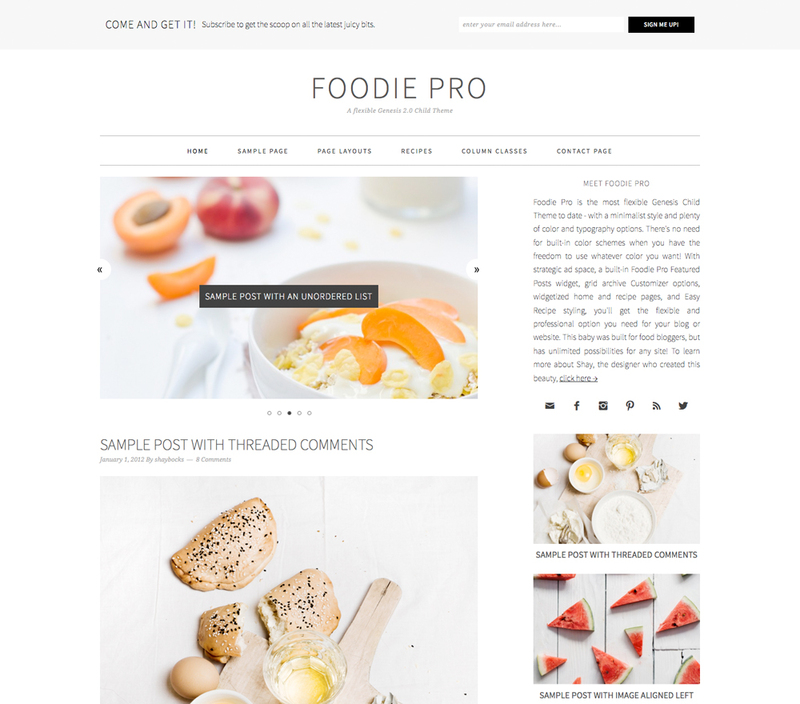 “With strategic ad space, a built-in Foodie Pro Featured Posts widget, grid archive Customizer options, widgetized home and recipe pages, and Easy Recipe styling, you get the flexible and professional option you need for your blog or website. 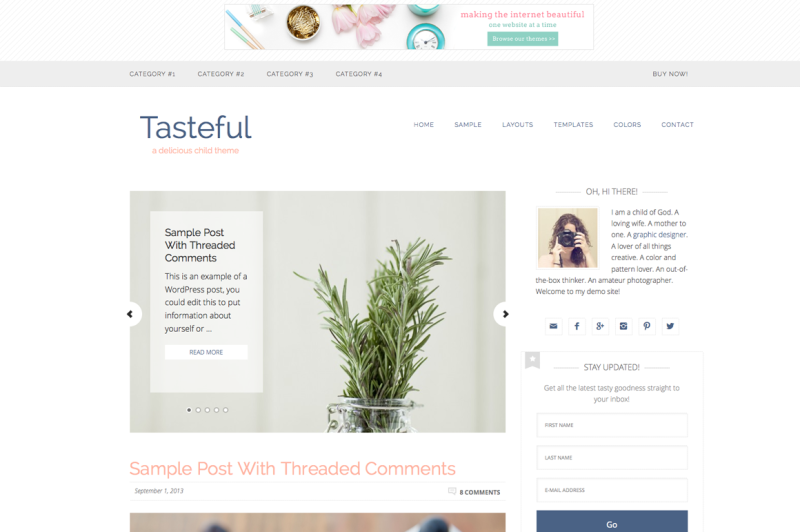 This baby was built for food bloggers, but has unlimited possibilities for any site!” This site can lay out recipes by category and date. Customizer options for color & typography, Recipe card styling, Widgetized Home & Recipe pages, Upload your own custom background and header design, Create your own custom menus and featured Images. The Genesis framework: Search engine optimization, mobile responsiveness, unlimited support, updates, domains, etc. airtight security, instant code updates, custom widgets and layouts, developers that can help you further customize. The Daily Dish Pro Theme ($99.95) is another simple and elegant theme that is a bit more bold then the previous. It is a Genesis Theme that includes mobile responsiveness so it works seamlessly on iPads and other mobile devices. It includes 6 layout options. 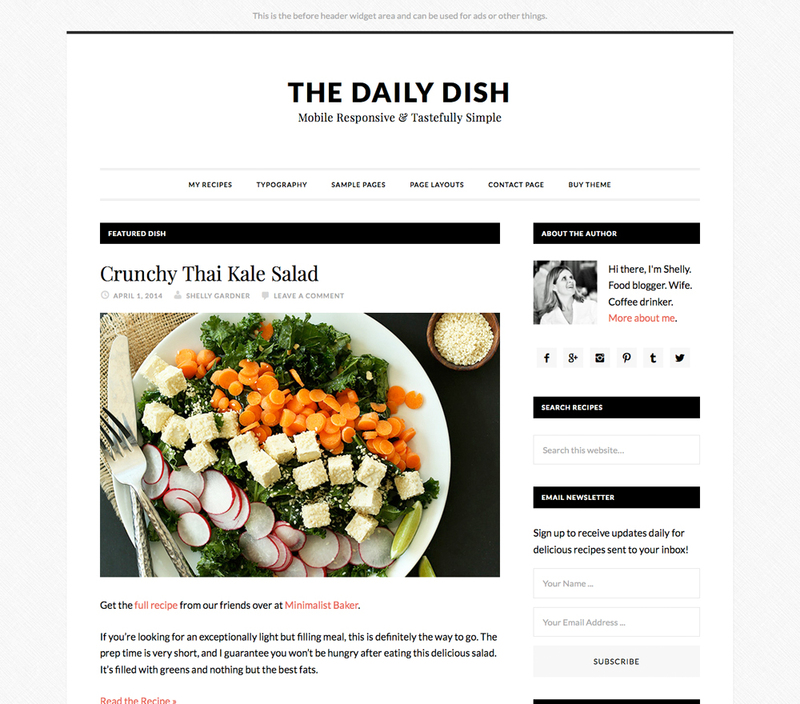 ” Daily Dish is a brand new theme for Genesis that is designed to present your content like it’s the most appetizing dish at your favorite 4-star restaurant. The main course of your site is, of course, your content: your words, your images, your videos, and more. Daily Dish orients visitors to focus on what’s most important.” You can use “content boxes” for recipe ingredients and directions. There is a before header widget area (background) that can be used for adds and other things. You can do featured dishes (by category as well). This entry was posted in Design and tagged assignment, design, responsive themes, themes on 28 October 2014 by Milen B. Gala (@galaliving). Here’s a really interesting article by CNN on style bloggers who have turned their passion for fashion into million dollar enterprises. With the use of social media including their online blog, Facebook, Twitter, Instagram and the like they have turned what was a passion that could only be shared with friends into a global sensation. This entry was posted in Resources on 7 October 2014 by Milen B. Gala (@galaliving).